The United Nations General Assembly has called on the Russian Federation to withdraw its troops from the Transnistrian region of Moldova, according to Ukraine's Permanent Representative to the UN Volodymyr Yelchenko. "Ukraine, as one of co-sponsors, welcomes the approval of the resolution of the UN General Assembly on the complete and unconditional withdrawal of foreign troops from the territory of the Republic of Moldova," Yelchenko said in a comment. 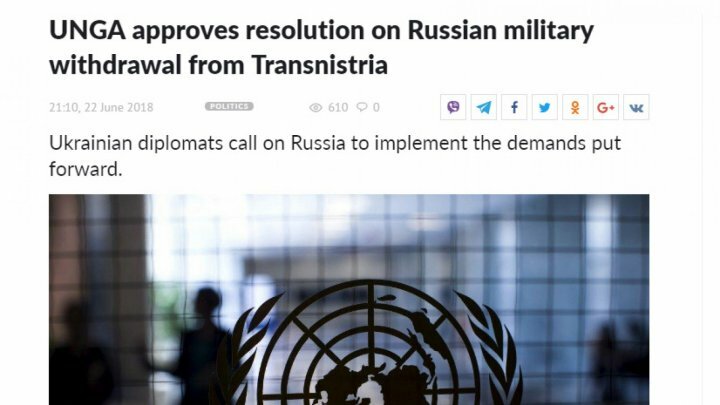 The diplomat notes that the resolution urges Russia to withdraw from Transnistria its forces, "which are stationed there without the permission of the official authorities and contrary to the constitution of Moldova." "We call on the Russian Federation to implement the approved resolution immediately, as well as to fulfill other international obligations within the framework of the Transnistrian settlement process," Yelchenko said. The Ambassador has noted that the Ukrainian side constantly advocates for the restoration of Moldova's sovereignty and territorial integrity and strongly condemns Russia's aggressive policy toward its neighbors, writes UNIAN. "Ukraine is all too familiar with the bear hug of the 'Russian world', which has occupied Crimea and Donbas," said Yelchenko. "What is most important is that despite the desperate attempts by the Russian side to block the draft resolution the General Assembly once again confirmed the violation by the Russian Federation of the UN Charter and other norms of international law. This will contribute to holding the Kremlin regime accountable for the crimes committed not only in Moldova, but also in Ukraine and other parts of the world," the Ukrainian Permanent Representative to the UN believes. "For our part, together with our partners, we will continue to actively use the UN instruments to promote Ukraine's interests, in particular, the de-occupation of Crimea and counteraction to Russia's military aggression in Donbas," Yelchenko concluded. As UNIAN reported earlier, Kyiv expressed readiness to let Russia pull out its forces from Transnistria via the Ukrainian territory, while Russia has not demonstrated it is willing to withdraw.